Most of the species of animals on Earth are arthropods. More than three fourths of the species that we know today are arthropods. It is estimated that there may be tens of millions of arthropod species. The earliest arthropod fossils that have been found so far are about 540 million years old. Arthropods live in water and on land. They are the only invertebrates that have evolved to survive successfully in dry environments. 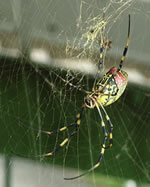 Jointed appendages - the name "arthropod" means "jointed foot." These appendages are specialized to serve different functions, such as movement (legs), defense (claws) or sensing (antennae). A body that is made up of segments during all or part of their lifecycle. An external skeleton, known as an exoskeleton, which is made up of a hard substance called chitin. The exoskeleton is replaced regularly through the process of molting as the animal grows. There is a limit to how large an arthropod can grow. As the arthropod grows larger, its exoskeleton becomes heavier and it becomes more difficult for its legs to support its weight. In addition, during molting, the arthropod has no exoskeleton with which to defend itself. This puts the arthropod at risk. Therefore, the number of times it can molt is limited. The respiratory system of arthropods also limits their size. Arthropods do not have respiratory systems like human beings, in which oxygen enters the body in one place (the lungs), and is then circulated to the different cells in the body. Instead, arthropods breathe through tubes known as tracheae, which are all over their bodies. Oxygen travels through he tracheae from the air directly to the the cells. As an arthropod grows larger, it becomes harder for oxygen to reach the cells that are deepest inside its body. If it grew too large, oxygen would not be able to reach all of its cells and it would suffocate. The largest arthropods in the world include the American lobster and the Japanese spider crab, which can weigh between 40 and 50 pounds.